INDIANAPOLIS – Representatives of the Henry Ford, a museum located in Dearborn, Mich., are on hand at the Indianapolis Motor Speedway this week to commemorate the 50th anniversary of Jimmy Clark’s win in the 1965 Indy 500. The sleek and iconic Lotus 38/1, designed and built by British legend Colin Chapman and powered by a specially built Ford V8, was the first rear-engine car to win at Indy, ushering in a new era of racing at the famed Brickyard. 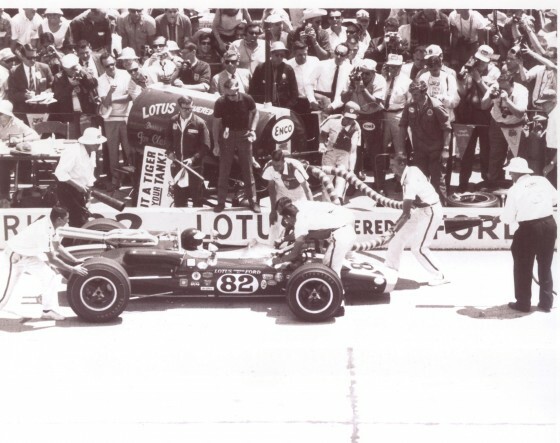 The project was a collaboration among Chapman, American racer and car-builder Dan Gurney and Ford, all hoping that bringing Formula One technology to Indy would give them a leg up. It worked, although it took three tries to get to Victory Circle. Clark, a Scotsman, was the first foreign driver to win the 500 since 1916, becoming the first driver to average over 150 mph (150.686). It was also Ford’s first win at the speedway. 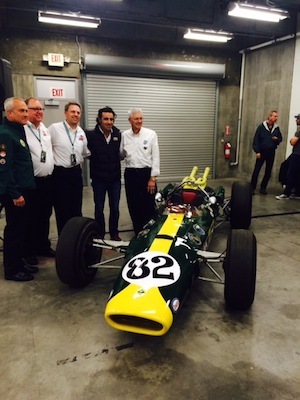 died in a racing accident before Franchitti was born, will drive the restored car during the parade laps prior to Sunday’s 99th running of the 500-mile race. He also got to test drive it briefly here at the speedway last month. Also on hand Thursday were Clive Chapman, Colin’s son and current head of Classic Team Lotus, and Leonard Wood, part of the original Wood Brothers race team, credited with inventing the modern pit stop and hired by Ford to pit Clark in the 1965 race. Wood said the brothers from Stuart, Va., were somewhat fearful that Chapman’s crew would resent their presence. Instead, they were welcomed with open arms. Clark ran the entire race without having to change what were then treaded tires, but the decision to hire the Wood Brothers paid off big when they figured out a way to refuel the car seconds faster than anyone else, giving Clark a huge boost on the track. “One of my brothers came looking for me a couple of days before the race and he couldn’t find me,’’ Wood said. “I had burrowed my way inside the big fuel tank (from which the cars were refueled at trackside) and was polishing the inside, to make it smoother and allow the fuel to flow better. We also moved the place where the fuel was put into the car to make it easier to reach and get a smoother flow. It was an amazing success for such a radically new car, even if it did take three tries. Now Wood and everyone else on hand Sunday at Indy can look forward to hearing that beautiful sound and seeing that sleek Lotus for at least a few laps.